I'm afraid we have another Otis situation. Penny is now in very urgent need of moving, her seven days are almost up. Does anyone have any space in their rehoming kennel or does anyone have an home that would suit Penny? Penny is not good with other dogs, but is great with people and loves children and is very loving. 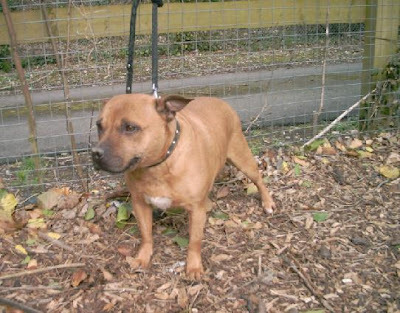 She will need to be walked on lead because of her temperament with other dogs. She is about five years old. She does not like being left for long periods of time and will complain for a short while, but settles soon afterwards. 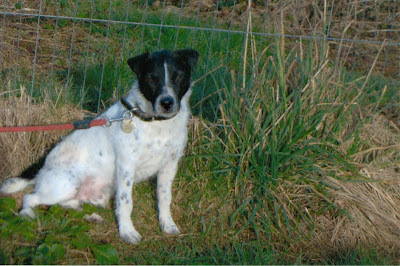 Penny will need to be spayed, vaxed and chipped as a condition of rehoming. She is currently in Surrey. I'm also going to mention Freddie again. I think his story has been overlooked. He's had quite a few disappointments in the past, but he's ever the optimist - like most dogs. He needs an urban home (away from sheep) and no cats. He gets on fine with other dogs - but best if they're not too small and cat like! Neutered, civilised apart from his sheep obsession. About 4 or 5 years old. If you think you and Freddie could be made for each other, please call Anne on 01341 241238. He is in Wales at the moment - but he really could do with moving to somewhere else where sheep are less of a temptation, so please don't be put off by his current geography. Freddie should not be a difficult dog to home as he his affectionate and good in the car, but as he needs to relocate that is the tricky part of this particular rehoming. Another factor is that Anne at Home-a-Dog is obviously poorly as she has terminal cancer. At her request we ran a successful appeal to find someone to take over her vital work with death row dogs a little while ago. The wonderful Demelda takes over Home-a-dog on May 1st, but I do think it would be a tremendous morale boost if Anne could see Freddie finally settled as he isn't enjoying kennels and would really thrive in a home. His previous attempts at happiness have all come to nothing - through no fault of his own. So does anyone have an urban fireside with a little empty space next to it? Anne thinks Freddie could even suit someone living in a flat. Please post this one far and wide. Let's put a smile on Anne's face and find Freddie his dream home. Had to remove two lots of spam in case anyone wonders what was so bad it was deleted! I really hope Penny is as lucky as Otis, she looks beautiful, and I really wish I could help. I'm also hoping that Feddie gets his forever home too, but at least he is safe. I'm also hoping that Feddie gets his forever home too, but at least he is safe. Yes, he is safe but the harsh reality is that he is taking up kennel space that could be used for other dogs that aren't safe. So whilst it's good for Freddie - other dogs may be killed for want of space. Well Penkitty, would you rather Freddie was PTS instead? I don't know if you misinterpreted what I meant, but Penny may be PTS, whereas Freddie isn't facing that option, luckily. Of course I don't want Freddie to be put down!!! I think you misunderstood me. I want both Penny & Freddie to get the homes they deserve. I just think that sometimes people tend to think that once a dog has been rescued from the pound therefore making it safe that it doesn't matter how long that dog waits for a home. Whilst you could argue that's true, if you look at the wider picture a lot of dogs that could have been saved from death (like Penny)will not be because there is no room for them. This is a major problem in particular for smaller rescues that try to take death row dogs off the pound. 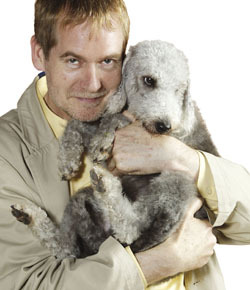 Inevitably some dogs will die because there is simply no where to put them. I was just highlighting the issue that is all. Well Penkitty, it appears we both want the same thing. I also would like to see both dogs find loving forever homes, my point was that Penny is under threat of being PTS. I have 1 staffy + 2 staffy X's, all rescues, and I do realise that it is becoming increasingly hard to rehome them. I would love to see every dog that is in rescue, find a happy home to live out their lives.